Officials said the fire that gutted a home on Holcombville Road in North Granville on Sunday, Sept. 24, 2017, was “suspicious.” It is being investigated. 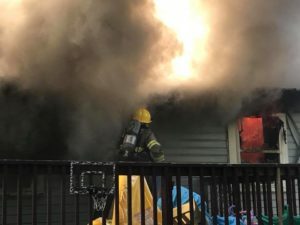 A fire that gutted a home on Holcombville Road in North Granville and left three homeless on Sunday has been deemed suspicious. “It’s under investigation and suspicious,” said Scott McCullen, North Granville fire chief. He said the Washington County Sheriff’s Department is investigating the cause of the fire. “Nothing has been confirmed yet,” said McCullen, noting that investigators were at the scene Sunday and returned Monday. “It’s all in the Sheriff’s hands now as far as the investigation goes,” he said. Firefighters from 10 local agencies spent several hours battling the blaze at 64 Holcombville Road. Just after 8:30 a.m. on Sunday, a passerby called in and reported the fire. Crews from the North Granville Fire Company Station 42 arrived within five minutes to find a double-wide mobile home engulfed in flames with smoke emanating from the structure. “We had heavy fire in the back. The whole back side was fully involved when we arrived,” McCullen said. There were no people inside, but a dog was able to escape from the structure. McCullen said the blaze was knocked down within 10 minutes of firefighters’ arrival. “It was a quick knock-down for us,” he said. After the fire was out, crews were tasked with ventilating and clearing the structure. That’s when the start of the blaze was suspected to be suspicious.